When plant matter is steam distilled, both essential oils (oil-soluble constituents), and hydrosols (water-soluble constituents) are produced. 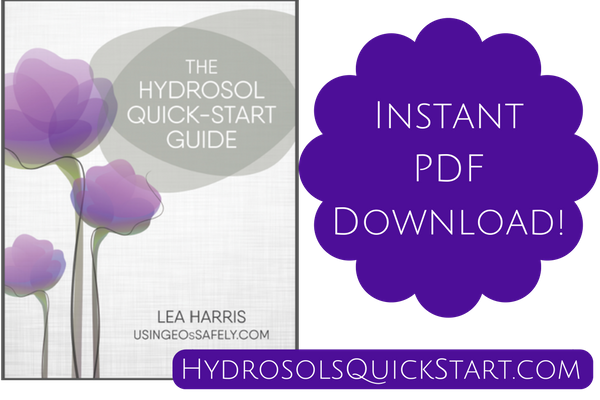 Hydrosols contain all of the water-soluble chemical constituents of distilled plant matter. Hydrosol comes from the Latin hydro, meaning “water,” and sol, which means “solution.” “Hydrosol” indicates any water-based solution, not specifically the type we are discussing here – but it is the word we will be using in this article. Floral water is not a very accurate representation, as hydrosols can be steam distilled from more than just flowers. 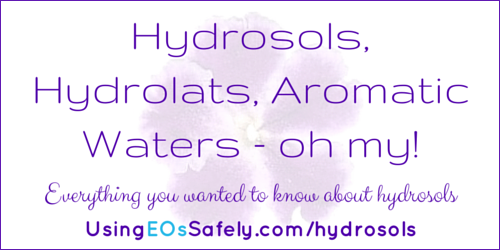 Aromatic water is an acceptable way to describe a hydrolat, as they are full of aroma. They don't always smell like their essential oil counterpart, however. Some smell better than others. If you find you don't like the aroma of a hydrosol that you acquired for its therapeutic benefit, you can blend it with a more pleasant-smelling hydrosol, or make it into a lotion, adding essential oils that you do enjoy. 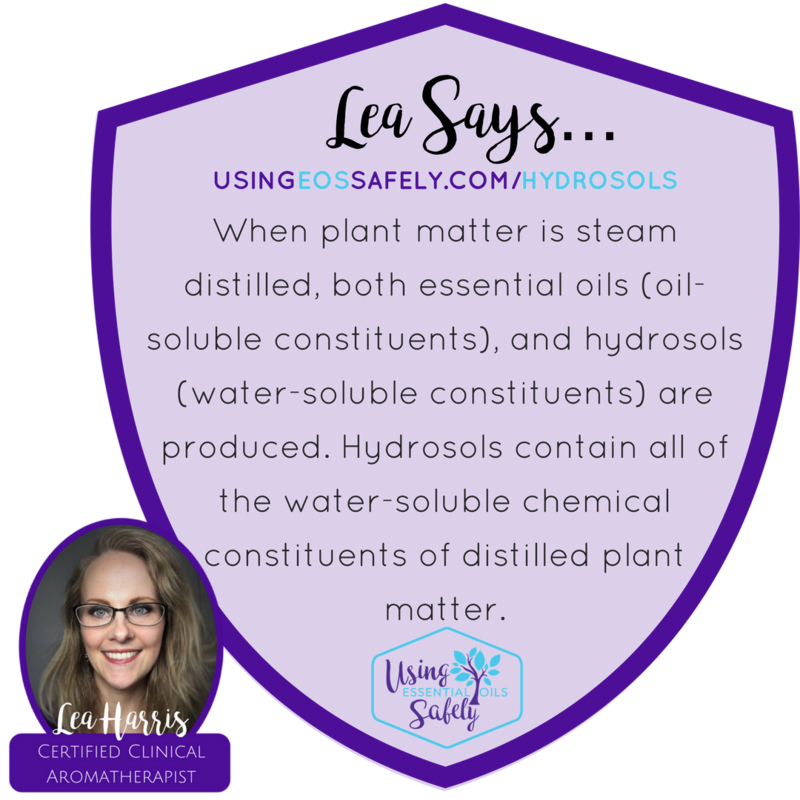 Hydrosols are made during the steam distillation of plant matter that produces both essential oils and hydrosols. Steam distillation has a simple, yet effective, design. A gentle fog-like steam enters through pipes with small vents located under a grate in the bottom of a large, tall pot containing plant matter. A tightly-fitting lid rests snugly on the pot, ensuring the steam makes its way into the tube leading to the condenser. The condenser contains coils, inside of which run cold water. This water cools down the steam, turning the steam back into water (hydrolat), and oil (essential oil). Many distillers use a Florentine flask for collecting the water and oil. This container is designed to efficiently separate the essential oil, which floats on the top, from the aromatic water underneath. One drain is located on the bottom of the container, allowing the overflow of hydrosol to flow out during distillation. A second drain is located near the top, and is used to decant the essential oil after distillation is complete. Once complete, and the oil is drained and collected, the remaining waters are again drained from the bottom drain. The end result will produce many more times hydrosol than essential oil. It can take an hour or longer to create a gallon of hydrosol, as best results are produced when slowly distilled under low pressure. This gallon will contain 0.2 – 0.8 milliliters of dissolved essential oil, which is not separated out due to its density. Hydrosols have very few safety issues. So few, I am going to list them all right here. If you are pregnant, it is best to avoid consuming Cypress, Cornflower/Bachelor's Button, Juniper Berry, Greenland Moss/Labrador Tea, Sweet Gale/Bog Myrtle, Rosemary, and Sage hydrosols. If you have renal/kidney disease, it is best to avoid consuming Cypress, Juniper Berry, and Goldenrod. If you have cancer, you will want to avoid consuming Bay Laurel/Bay Leaf. For kids under age 2, it is recommended Sweet Gale/Bog Myrtle hydrosol be avoided (presumably internally only); for kids under age 6 it is recommended that Greenland Moss/Labrador Tea be diluted (doesn't say how much) before use. If you have a seizure disorder, it is recommended Greenland Moss/Labrador Tea be avoided. Note: one sources prefers Peppermint be avoided on children under age three, but doesn't cite any research. The same source suggests Eucalyptus be diluted when used topically and internally for kids under age 4, but again doesn't cite a reference. I personally feel this caution is not warranted, but the ultimate decision is yours to make. Both hydrosols and essential oils have their place. 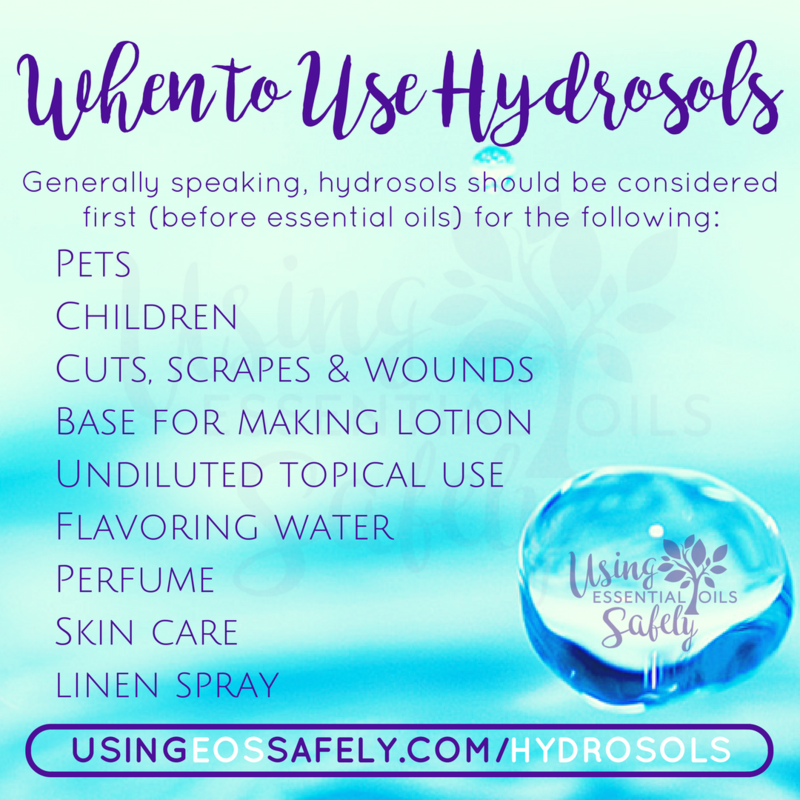 Here are some examples of when hydrosols are the best choice, and when essentials oils are preferred. Many hydrosols have a shelf life of two years, but because they contain very little natural preservatives, some only last a year. Refrigerating your hydrosols can extend the shelf life. If you don't have room in your food fridge, you can purchase a small dorm-sized refrigerator on amazon (I like this purple mini fridge!). Beyond the visual signs of cloudiness or floating bits of growth in your bottle, you can also use pH strips to get a head's up when your hydrosols are going bad. 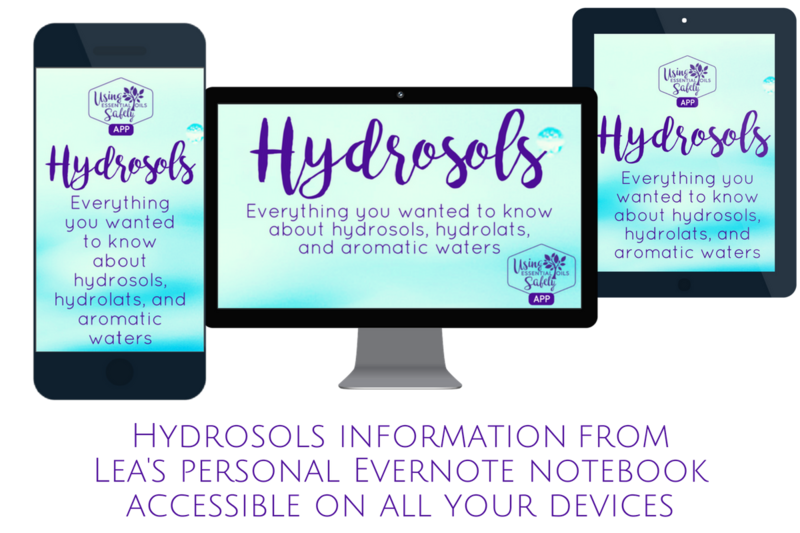 Hydrosols have their own range of expected pH values which vary from 2.9 to 6.5 (essential oils have a pH of between 5.0 and 5.8). Test the hydrosols once when you receive them, and then again every three weeks. If you start to see the numbers drop, you know the hydrosol is starting to go bad. Hydrosols can be also used as food flavorings when added to water, juice, sauce, soups, salad dressings, cake mixes, yogurt, homemade ice cream, popsicles, and ice cubes. Hydrosols do not require dilution before topical application. 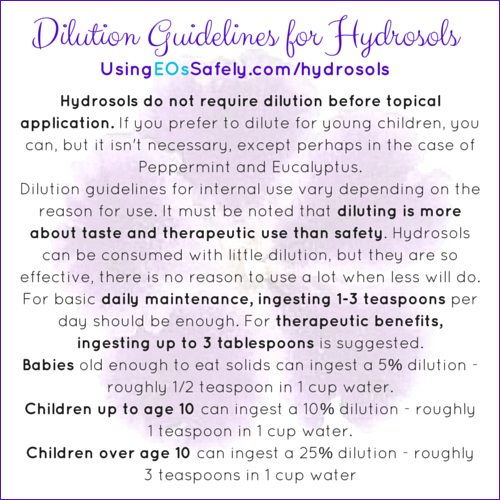 If you prefer to dilute for young children, you can, but it isn't necessary, except perhaps in the case of Peppermint and Eucalyptus. Dilution guidelines for internal use vary depending on the reason for use. It must be noted that diluting is more about taste and therapeutic use than safety. 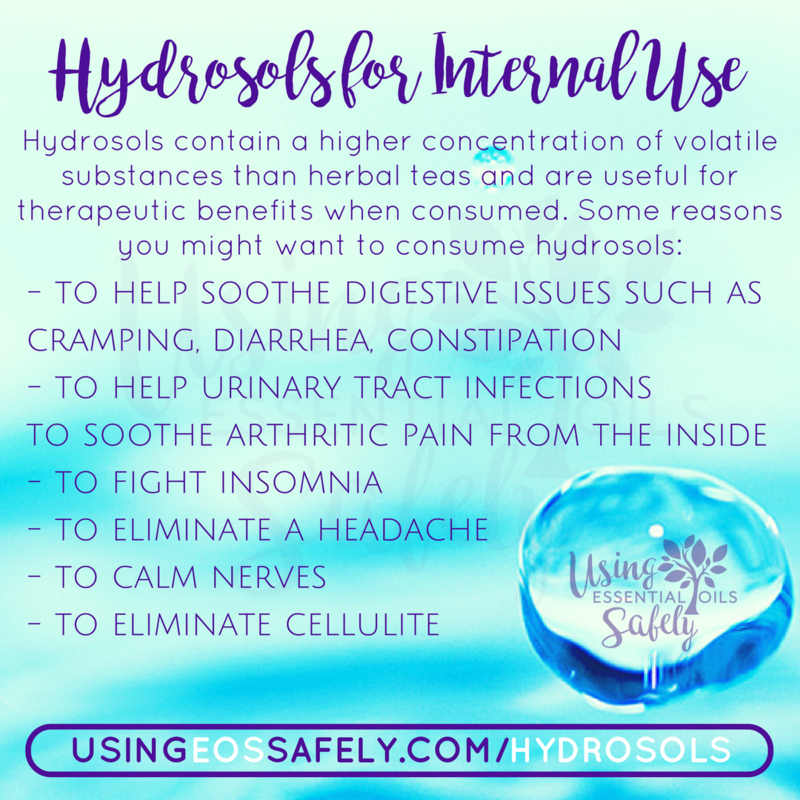 Hydrosols can be consumed with little dilution, but they are so effective, there is no reason to use a lot when less will do. For basic daily maintenance, ingesting 1-3 teaspoons per day should be enough. For therapeutic benefits, ingesting up to 3 tablespoons is suggested. 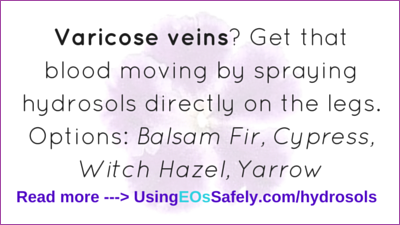 Although you can't “overdose” on hydrosols, there is no need to use more than necessary. If you do feel compelled to consume more, listen to your body's urges, and do so. This likely won't last for more than a few days or weeks, and then you will probably find yourself backing off. Babies old enough to eat solids can ingest a 5% dilution – roughly 1/2 teaspoon in 1 cup water. Children up to age 10 can ingest a 10% dilution – roughly 1 teaspoon in 1 cup water. This is not an exhaustive list. 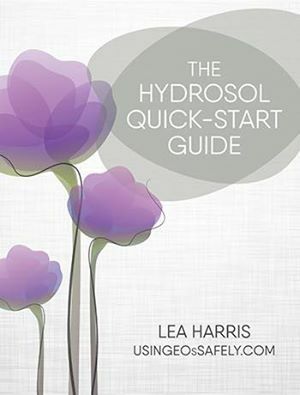 There are many more hydrosols available (see “Recommended Resources” art the bottom of this post). I am choosing to focus on my personal top 16 choices. It was hard to narrow down, though! Cypress Cupressus sempervirens – analgesic, anti-tussive, balancing, detoxifying, diuretic, expectorant, stimulant, styptic. There is no evidence that hydrosols cause sensitization. If you find one that works for you, there is no need to rotate it with other hydrosols, like you would with essential oils. Internal use suggestions are in italic. 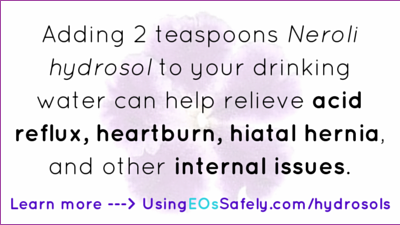 Adding 2 teaspoons Neroli hydrosol to your drinking water can help relieve acid reflux, heartburn, hiatal hernia, and other internal issues. 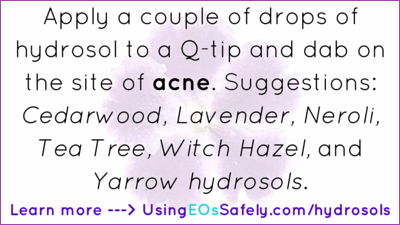 Apply a couple of drops of hydrosol to a Q-tip and dab on the site of acne. Suggestions: Cedarwood, Lavender, Neroli, Tea Tree, Witch Hazel, Yarrow hydrosols. 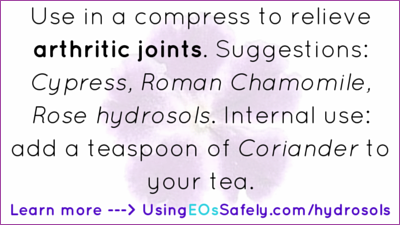 Use in a compress to relieve arthritic joints. Suggestions: Cypress, Roman Chamomile, Rose hydrosols. Internal use: add a teaspoon of Coriander to your tea. 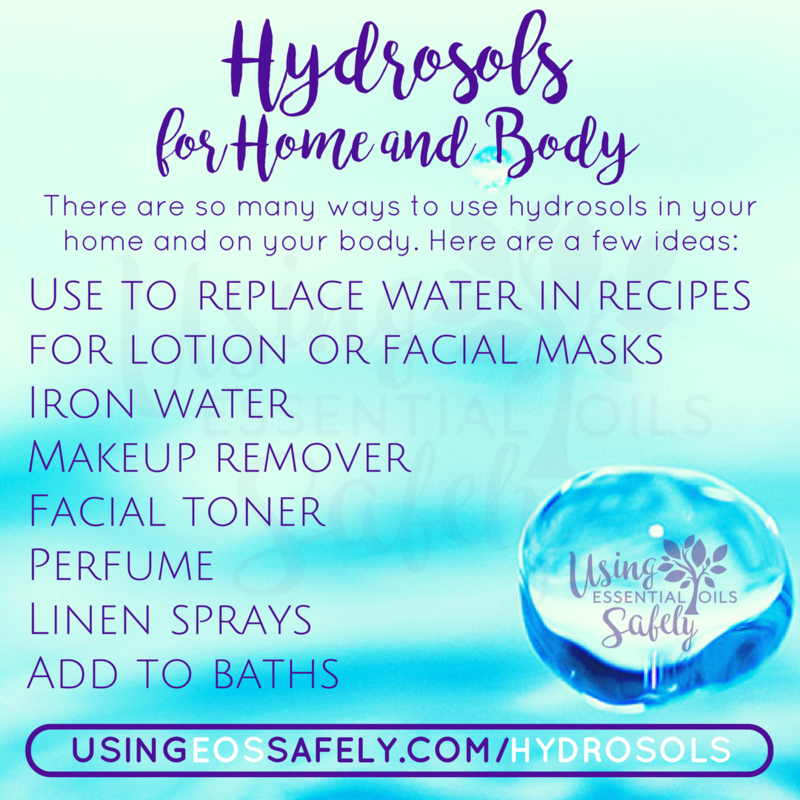 Hydrosols can be therapeutic when added to your bath water. 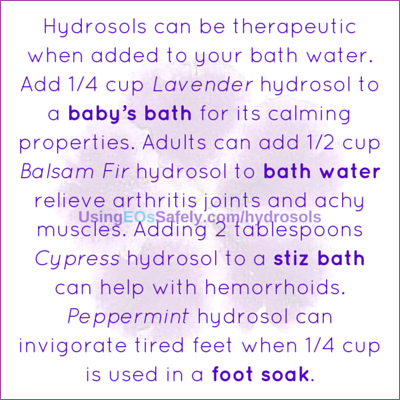 Add 1/4 cup Lavender hydrosol to a baby's bath for its calming properties. Adults can add 1/2 cup Balsam Fir hydrosol to relieve arthritis joints and achy muscles. Adding 2 tablespoons Cypress hydrosol to a stiz bath can help with hemorrhoids. Peppermint hydrosol can invigorate tired feet when 1/4 cup is used in a foot soak. 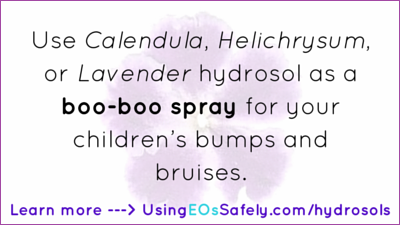 Use Calendula, Helichrysum, or Lavender hydrosol as a boo-boo spray for your children's bumps and bruises. 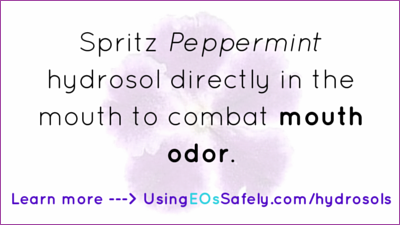 Spritz Peppermint hydrosol directly in the mouth to combat mouth odor. 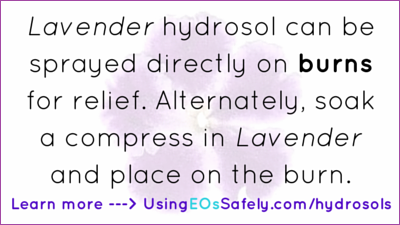 Lavender hydrosol can be sprayed directly on burns for relief. Alternately, soak a compress in Lavender and place on the burn. 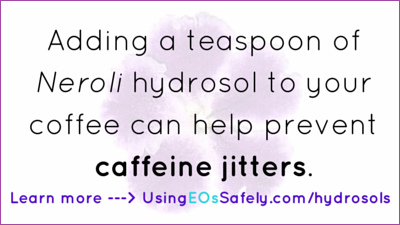 Internal use: adding a teaspoon of Neroli hydrosol to your coffee can help prevent jitters. 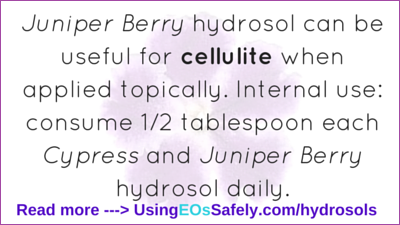 Juniper Berry hydrosol can be useful for cellulite when applied topically. Internal use: consume 1/2 tablespoon each Cypress and Juniper Berry hydrosol daily. 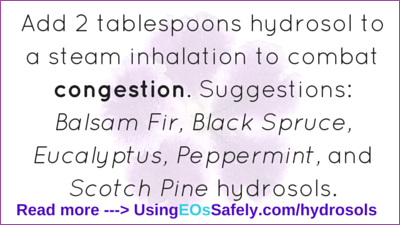 If you run out of essential oil, you can add 2 tablespoons hydrosol to a steam inhalation to combat congestion. Suggestions: Balsam Fir, Black Spruce, Eucalyptus, Peppermint, and Scotch Pine hydrosols. 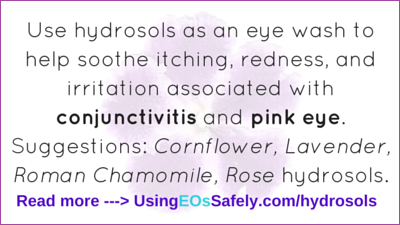 Use hydrosols as an eye wash to help soothe itching, redness, and irritation associated with conjunctivitis and pink eye. Suggestions: Cornflower, Lavender, Roman Chamomile, Rose hydrosols. 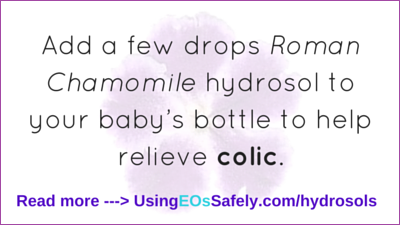 Add a few drops Roman Chamomile hydrosol to your baby's bottle to help relieve colic. 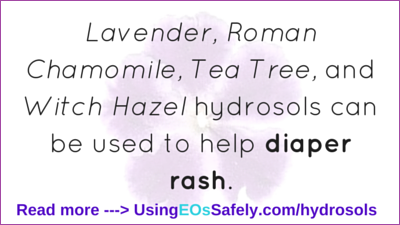 Lavender, Roman Chamomile, Tea Tree, and Witch Hazel hydrosols can be used to help diaper rash. 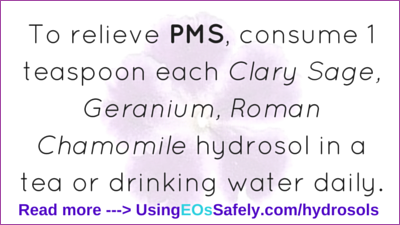 Internal use: add Basil, Peppermint or Roman Chamomile hydrosol to your drinking water. Rosemary is useful for constipation when 1 tablespoon added to water and consumed. 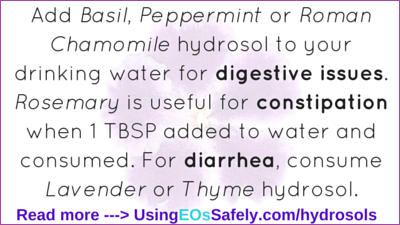 For diarrhea, consume Lavender or Thyme hydrosol. 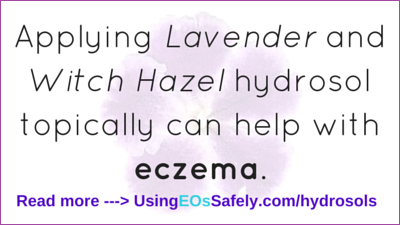 Applying Lavender and Witch Hazel hydrosol topically can help with eczema. 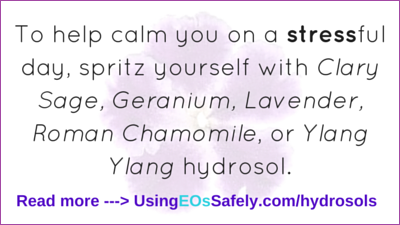 To help calm you on a stressful day, spritz yourself with Clary Sage, Geranium, Lavender, Roman Chamomile, or Ylang Ylang hydrosol. 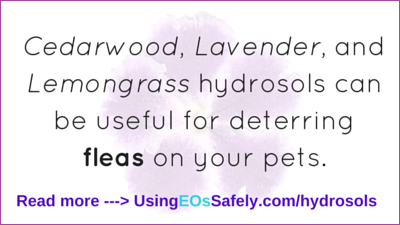 Cedarwood, Lavender, and Lemongrass hydrosols can be useful for deterring fleas on your pets. 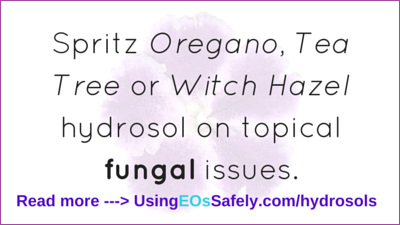 Spritz Oregano, Tea Tree or Witch Hazel hydrosol on topical fungal issues. 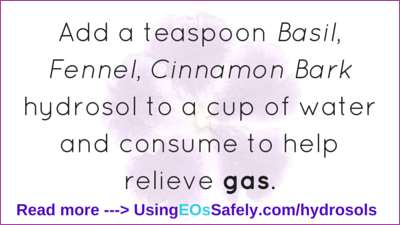 Internal use: add a teaspoon Basil, Fennel, Cinnamon Bark hydrosol to a cup of water and consume. Mix together 2 teaspoons each water and Frankincense or Tea Tree hydrosol and use as a mouthwash for gingivitis or gum infections. 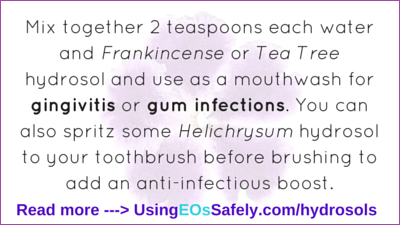 You can also spritz some Helichrysum hydrosol to your toothbrush before brushing to add an anti-infectious boost. Add Roman Chamomile hydrosol as a hair rinse. 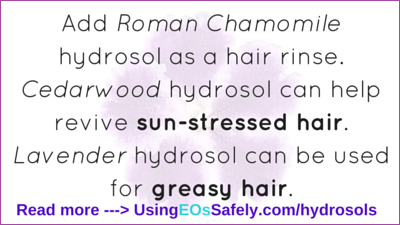 Cedarwood hydrosol can help revive sun-stressed hair. 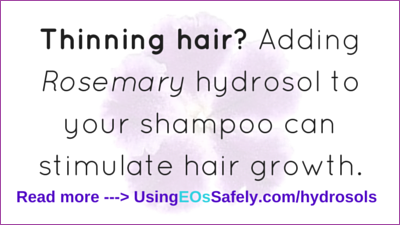 Lavender hydrosol can be used for greasy hair. 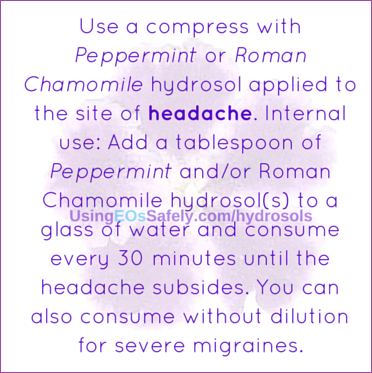 Use a compress with Peppermint or Roman Chamomile hydrosol applied to the head where it aches. Internal use: Add a tablespoon of Peppermint and/or Roman Chamomile hydrosol(s) to a glass of water and consume every 30 minutes until the headache subsides. You can also consume without dilution for severe migraines. 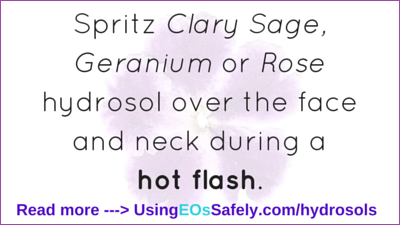 Spritz Clary Sage, Geranium or Rose hydrosol over the face and neck during a hot flash. 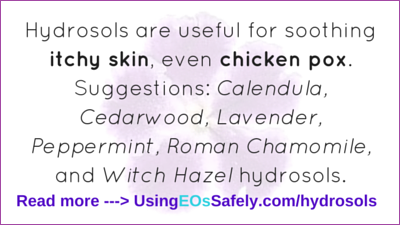 Hydrosols are useful for soothing itchy skin, even chicken pox. Suggestions: Calendula, Cedarwood, Lavender, Peppermint, Roman Chamomile, and Witch Hazel hydrosols. 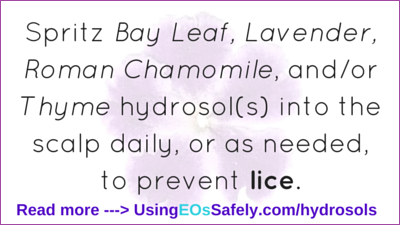 Spritz Bay Leaf, Lavender, Roman Chamomile, and/or Thyme hydrosol(s) into the scalp daily, or as needed, to prevent lice. 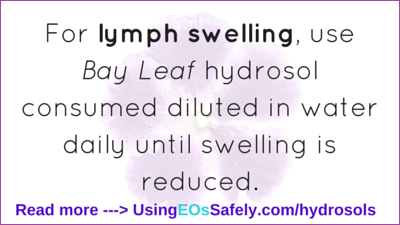 Internal use: Bay Leaf hydrosol consumed diluted in water daily until swelling is reduced. 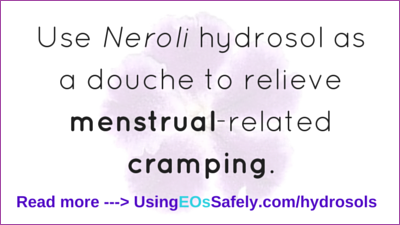 Use Neroli hydrosol as a douche to relieve menstrual-related cramping. 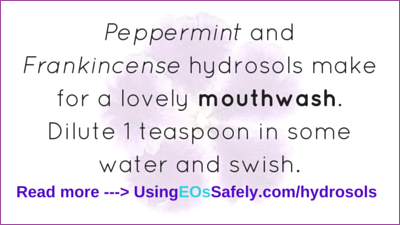 Peppermint and Frankincense hydrosols make for a lovely mouthwash. Dilute 1 teaspoon in some water and swish. Add 2 teaspoons each Fennel and Peppermint to a cup of ginger tea to combat nausea or upset stomach. Internal use: Consuming 1 teaspoon each Clary Sage, Geranium, Roman Chamomile hydrosol in a tea or drinking water daily. 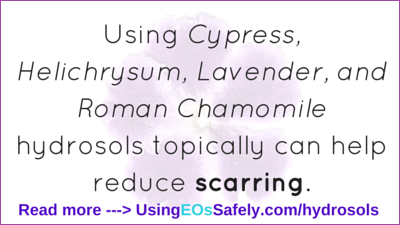 Using Cypress, Helichrysum, Lavender, and Roman Chamomile hydrosols topically can help reduce scarring. 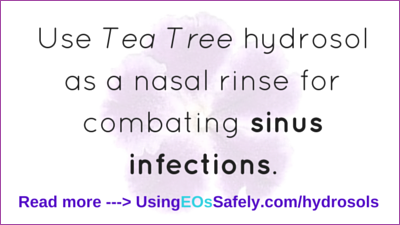 Use Tea Tree hydrosol as a nasal rinse. 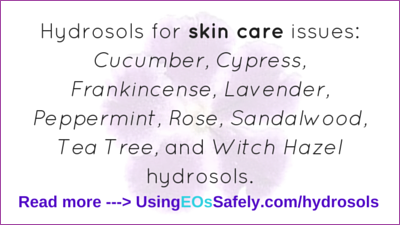 Hydrosols are an awesome choice for skin care issues. Suggestions: Cucumber, Cypress, Frankincense, Lavender, Peppermint, Rose, Sandalwood, Tea Tree, and Witch Hazel hydrosols. 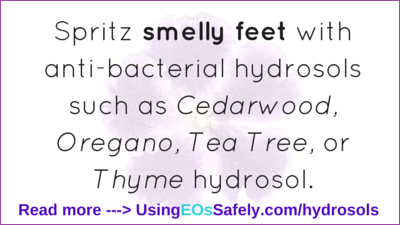 Spritz smelly feet with anti-bacterial hydrosols such as Cedarwood, Oregano, Tea Tree, or Thyme hydrosol. 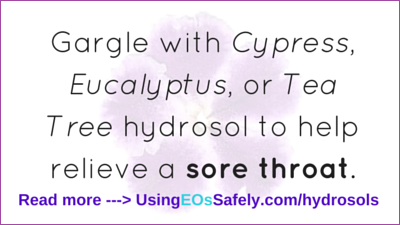 Gargle with Cypress, Eucalyptus, or Tea Tree hydrosol to help relieve a sore throat. 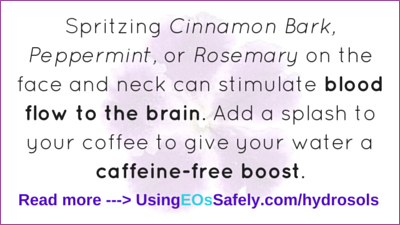 Spritzing Cinnamon Bark, Peppermint, or Rosemary on the face and neck can stimulate blood flow to the brain. Internal use: adding a splash to your coffee can give your water a caffeine-free boost. 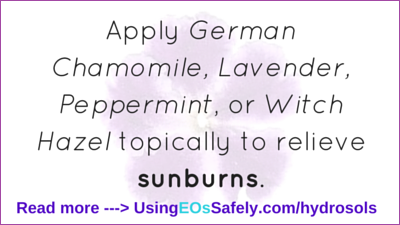 Apply German Chamomile, Lavender, Peppermint, or Witch Hazel topically to relieve sunburns. 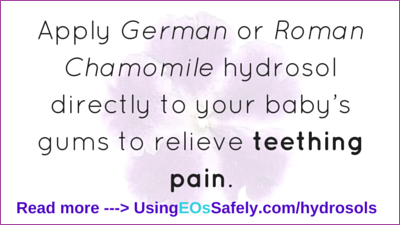 Apply German or Roman Chamomile hydrosol directly to your baby's gums to relieve teething pain. Adding Rosemary hydrosol to your shampoo can stimulate hair growth. 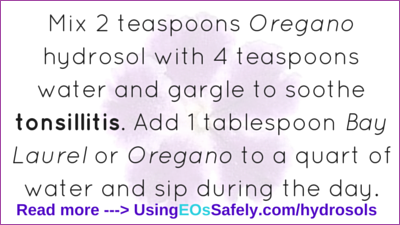 Mix 2 teaspoons Oregano hydrosol with 4 teaspoons water and gargle. Internal use: add 1 tablespoon Bay Laurel or Oregano to a quart of water and sip during the day. Make a nightly ritual of spritzing a hydrosol over your face and neck to prevent or fight wrinkles. Suggestions: Frankincense, Carrot Seed, Helichrysum, Lavender, Roman Chamomile, Rose, Yarrow. 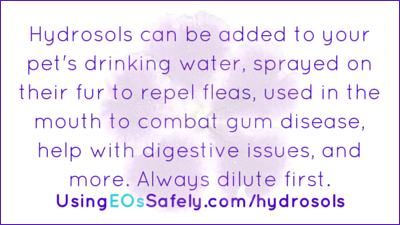 Hydrosols can be added to your pet's drinking water, sprayed on their fur to repel fleas, used in the mouth to combat gum disease, help with digestive issues, and more. They must always be diluted first. 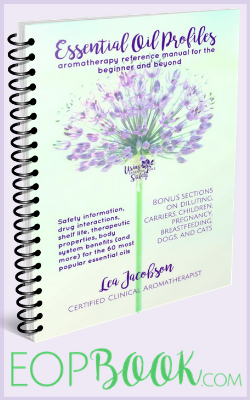 For more information on how to use hydrosols with pets, consult one of our recommended resources. You can also find the two articles I wrote about hydrosols for The Herbal Academy of New England earlier this year, which they published in The Herbarium. Do you have a question or comment? Leave a comment on this post, post in the FB group, or e-mail me. Wow! You sure went to a lot of effort to create this reference page. Thanks so much.